‘Tidying up with Marie Kondo’ has captured the nation’s imagination since it’s New Year’s Day premiere. The show has sparked a national conversation (there’s a good chance you’ve seen the show mentioned on social media) on home organization, and even thrift stores, consignment shops, and donation centers have experienced a rise in donations in January. There’s no doubt the show is inspiring some major decluttering! The KonMari Method (check out this previous blog post to learn the basics) works for everyone, even kids. 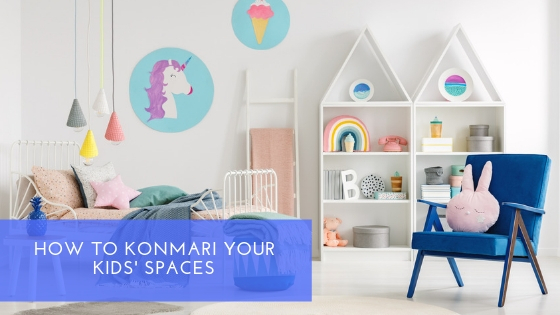 If you’re feeling overwhelmed by the amount of “stuff” in your kids’ rooms, here’s how you can encourage them to embrace the KonMari Method in their spaces too. Kids learn by watching others so its important that you’re modeling the behavior you want them to display. Which means before working on their rooms, its important for parents to declutter their belongings first. This teaches kids two things: first, it shows them what living in a clean house looks and feels likes, and second, that there is some joy in tidying up. Instead of moving from room the room, the KonMari Method follows a specific order: clothes, books, paper, komono (miscellaneous items – basically everything else), and finally sentimental items. This allows you to see exactly how much stuff in a given category you have. Start by gathering all of your kids’ clothes and place them in one spot. Then go through each item to see if it “sparks joy” in your child. Donate, sell items, or recycle/toss items you no longer need. Repeat this process with each remining category. When it’s time to store what’s kept, store like items together. Instead of a single toy chest, place toys in groups in different containers. This keeps kids from digging through all of their toys while looking for a specific item. Convincing your kids to part with their belongings can be difficult but Marie Kondo stresses the importance of making each person responsible for their own belongings. Forcing someone to part with an item can have a negative effect. Instead of waiting for a moment when the children are gone, encourage them to go through their items, selecting those that spark joy in them and thanking the items that don’t for the joy they brought. Also have them fold their clothes and put away their belongings. This is important because when kids have a hands-off experience with tidying, they can fully appreciate the feeling of living in a clean home and are more likely to keep it clean. Parsing through your kids’ artwork can be the most challenging task. Since they’re often sentimental, tackle this task last. Go through the art with your kids and have them select the ones that are their favorites. If they have a lot, have them rank them and let them keep the top few. Display or store the pieces you chose and don’t feel guilty about tossing the rest. Instead of focusing on what you’re getting rid of, encourage your kids to think of the items they are keeping and how it fits into their right now lives.